EMI Certifications AS9100C, ISO 9001:2008 & ITAR | EMI Solutions Inc.
EMI Solutions has been providing quality and trust since 1996. Part number specific RoHS and REACH Compliance certificates available upon request. 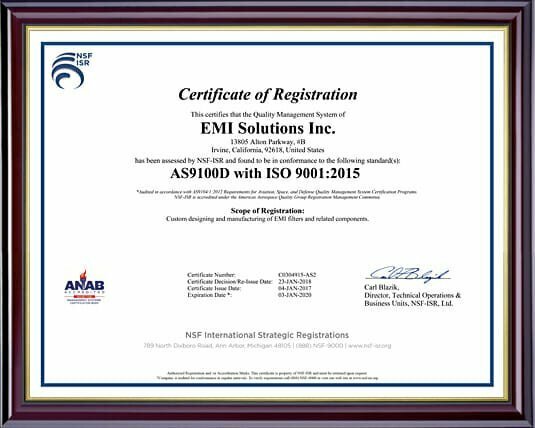 EMI Solutions Inc. has been assessed by NSF-ISR and found to be in conformance to the following standard(s): AS9100D/ISO9001:2015. Audited in accordance with AS9104/1:2012 Requirements for Aviation, Space, and Defense Quality Management System Certification Programs. NSF-ISR is accredited under the Americas Aerospace Quality Group Registration Management Committee. Custom designing and manufacturing of EMI filters and related components. 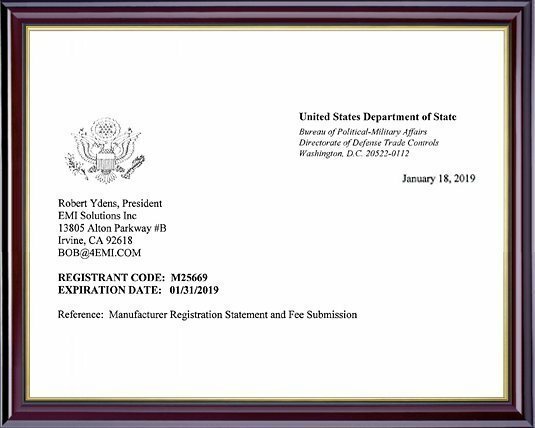 EMI Solutions Inc. has been assessed by The Office of Defense Trade Controls Compliance to be in conformance to the following standard(s): The Arms Export Control Act (AECA) and the International Traffic in Arms Regulations (ITAR Part 122). Manufacturing and/or exporting defense articles or furnishing defense services.